Today, mobile phone becomes king for getting the direct push notifications on the regular basis. There are numerous people who don’t want to who install applications to save the time of surfing. This thing increases the trend of install Mobile Applications for web browsing. The trend of Mobile web browsing has been steadily rapidly growing since 2009; however the desktop’s share of web traffic has gradually decreased. According to the search, global mobile and tablet browsing accounting is 51.3% against the desktop’s 48.7% in the worldwide. Well, we have fetched separate indexing for the iOS and android connected devices. This helps to consumed ratio of the categories such as social messaging, news, Facebook, YouTube and entertainment. The mobile users have been increased from the past few years due to invention of latest few years. You can check 32 % users are busy in game playing. The Facebook with the highest traffic is considered in the second rank positioned. Social platforms have also been increased the users like twitter is covered almost 1.5% users. The massive efforts by Google and Facebook, the market is not consolidated and over the few past years. We have known that there are various franchises emerge in every part of the mobile. These include different apps such as, Pinterest, Snapchat, WhatsApp , Waze , Spotify and several others. In term of apps which lost share from 2013 to 2014, the notable example is Safari that decreases from 12% to 5%. Likewise, the non-Google and non-apple decrease 4 to 2%. You also note that time spent in native apps, 2 hours and just 19 minutes this year is only up 12 minutes per day. 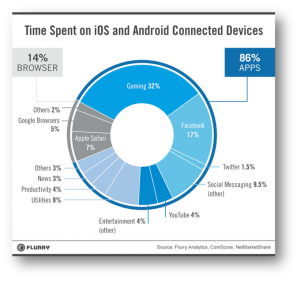 From last year, this is very notable that how much time users have to spend on the devices and apps. 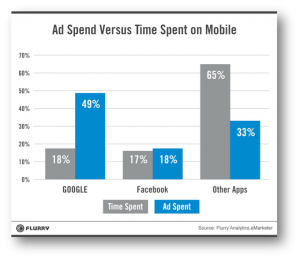 According to the, flurry reviewed mobile advertising, said that Facebook earned 17.5% mobile ad incomes, which is in line with their share of time spent on mobile, while Google earned 49.3%, or much more than their time spent. Non-Google, non-Facebook apps accounted for 65.3% of time spent but only saw 32% of ad revenues.